Industrial and commercial locations are filled with sensitive electronics equipment. These devices are easily damaged by power surges, also called transients, spikes or voltage impulses. It only takes one lightening storm near your location to create a high energy electrical surge that can enter your facility and destroy your computers, CRT’s, HMI’s, control instrumentation and electronic sensors. Surges can also travel on your telephone lines. This energy surge travels through your internal phone lines and can destroy all your equipment that is attached. Cutler-Hammer plug-in surge protectors offer exceptional protection for electrical and electronic devices. 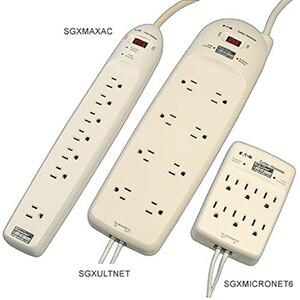 Each of the Surge Strip series; Ultra, Max and Micro are available in AC only and AC plus telephone/modem. The Ultra series 3-Way, in addition to having the above options, is available in AC plus telephone/modem and cable. Construction series surge strip products are also available for heavy duty applications. Even if your facility has an installed surge suppressor, the Institute of Electrical and Electronic Engineers (IEEE) recommends two stages of surge suppression to provide the best protection for electronic equipment. A quality Cutler-Hammer Surge Trap surge strip installed at the point of use reduces any voltage remnant down to an acceptable level and provides an added level of protection for your equipment. 1 outlet, wall mount - AC power, telephone/modem. 5 year product warranty, $50,000 connected equipment, 10 per pack.